At SAG Mart Blog, view the news of all upcoming bikes with their features and specifications. Get to their launching date too. You are reading car category section. We publish useful information about popular shopping cars. The countless hours of wait has ended up with the launching of Moto E, the most awaited and most talked smartphone of Motorola has finally got unpacked today dated May13, 2014 as scheduled. As it was previously scheduled that the phone will be yanked off its curtain from the most rumoured device Moto E in an event in London. The phone has also been made entry in the Indian market with a low price tag. The newly introduced handset of Motorola was getting attention from the day of its announcement and now when it has been rolled out for the world, it is surprising every age of persons; from youth to old, with a very low price tag of Rs. 6,999 only. The phone will be available from Wednesday to buy from Flipkart as company had launched its previous flagship smartphones Moto G and Moto X via Flipkart, as per its strategy. Now it has lined up its another handset of Moto series. The phone sounds good with price range but also disappoints in some aspects by adding no flash and front facing camera to the device as Nokia Lumia 630, which was launched on Monday with dual SIM support. 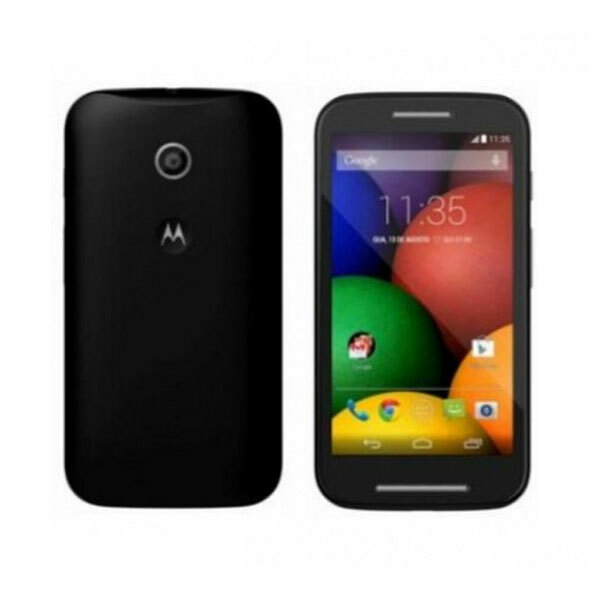 Moto E features 4.3 inch display that promises the screen resolution of 720×1280 pixels. Its dual-core Qualcomm Snapdragon 200 processor is sufficient to work at 1.2GHz CPU frequency. Its 1GB of RAM adds more advantage to this budget smartphone and Android 4.4 KitKat makes the interface more attractive and interactive which can be count as a rewarding step of Motorola. Moto E comes along with 4GB of built-in storage and it is integrated with microSD card slot which can store the data upto 32GB. It sports 5MP of rear snapper to click images at quality resolution. Although its 1,980mAh battery is just average but as per its price range, it also adds value to the phone. It is weighed 140 grams. Although Motorola is not a big name in mobile industry but because of its marketing strategy, it has been turned into a popular brand and now stand with the well established mobile companies Apple, Samsung, Nokia etc. All credit goes to its previously launched devices Moto G and Moto X. This is the third product of Motorola which is ready to introduce via Flipkart tomorrow. Now the time is to wait for the handset to come on the Flipkart. And, the time will decide will the newly launched Moto E make success to win the market or would it be reached to the peak of success?